Leaching characteristics of solid earthy and stony buildings and waste materials. Leaching tests. Determination of the leaching of inorganic components from granular materials with the column test. Intention of the column test is to determine the leaching of inorganic components from solid earthy and stony materials and wastes as a function of the value of L/S. Demineralized and acidified water (HNO3 , 1±0,1 mol/L, analytically pure quality) with a conductivity less than 1µS/cm is used as leaching liquid. The liquid is passed through the material in a vertical column with a internal diameter of 5 cm (±0,5cm) and a fillable height of at least 4 times the internal diameter from the bottom to the top. 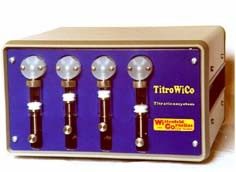 The pH-value is not regulated but the System TitroCol7343 allows a continous registration of the pH at the outlet of the column. After set quantities of leaching liquid have passed through the column, the concentration of the leached components in the eluate are analysed. For one single column test between 0,5L to 0,7L of test material is needed. The test is carried out in seven stages at a temperature between 18°C and 22°C. Before the material is filled into the column, rinse the system first with nitrid acid and then with acidified water. Fill the column with the material up to a height of about four times the internal diameter of the column. The mass of the material is calculated at the difference of the weight of the filled and the empty column. It is necessary to know the moisture of the material to calculate the dry mass of the material. On a dry mass of one kg the max. flow rate is 25 mL/h, the duration of the test is about 400 hours (less than 17 Tage). Seven fractions will be build. The following table show volume of the fractions (dependend of dry mass) and the relation of liquid to solid. Sorry, most of our other pages are only available in german!